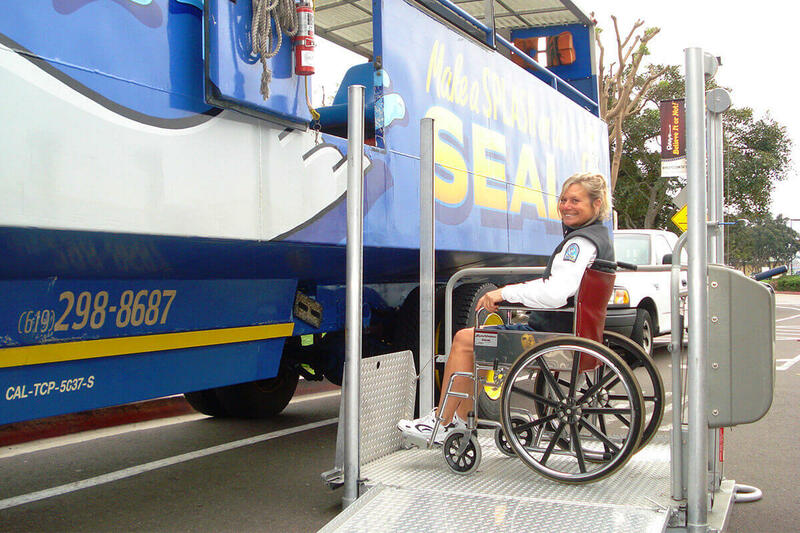 A number of our SEAL fleet vehicles are equipped with a manual lift that can accommodate a common wheelchair as defined in CFR 49 Parts 27, 37, and 38 or ambulatory accommodations. We are happy to provide this service. This will assure that a properly equipped vehicle will be made available for your use. Please arrive early, no less than 30 minutes prior to your departure time, so that we can accomplish the loading process smoothly and safely. As always, collapsible wheelchairs are permitted on our SEALs and our CASTmembers are willing and able to assist with the loading. The Americans with Disabilities Act of 1990 (ADA) defines a “common wheelchair” as a mobility aid belonging to any class of three or four-wheeled devices, usable indoors, designed for and used by individuals with mobility impairments, whether operated manually or powered. A “common wheelchair” does not exceed 30 inches in width and 48 inches in length measured two inches above the ground, and does not weigh more than 600 pounds when occupied. The Americans with Disabilities Act (ADA) Title III regulations defines a service animal as any dog that is individually trained to do work or perform tasks for the benefit of an individual with a disability, including a physical, sensory, psychiatric, intellectual, or other mental disability. We request 24-hour advance notice. A hearing impaired tour script guide with pictures may also be provided upon request. We request 24-hour advance notice by calling (866) 955-1677. We look forward to having you join us on San Diego’s SEA & Land Adventure tour. 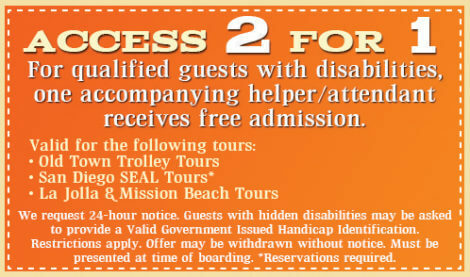 SEAL Tours are accessible for our disabled guests only at our Seaport Village stop located at 470 Kettner Blvd.